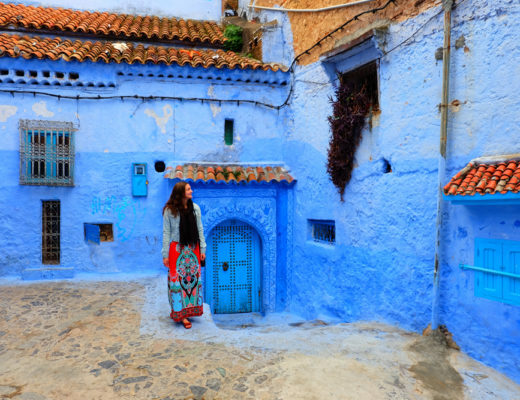 Morocco is a country that is rich in colour and culture, and the vibrancy of this country is one that should be experienced at least once in your life (in my opinion). When I traveled to Morocco back in November/December of last year, I fell in love with everything the country had to offer—the food, the people, the mint tea, the markets, the peacefulness combined with the chaos. 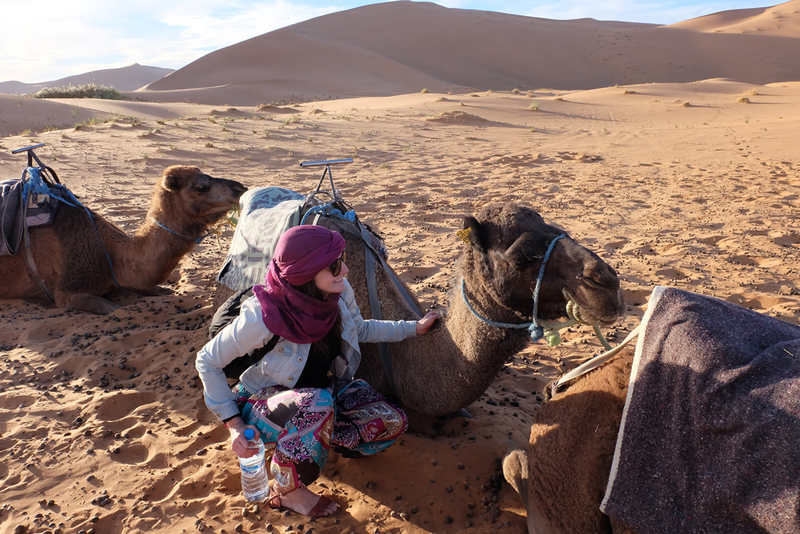 Morocco is seriously a bucket list destination and although not everyone has the luxury to visit the country for two weeks, if you have the ability to, I strongly recommend you take the time to really see everything the country has to offer. 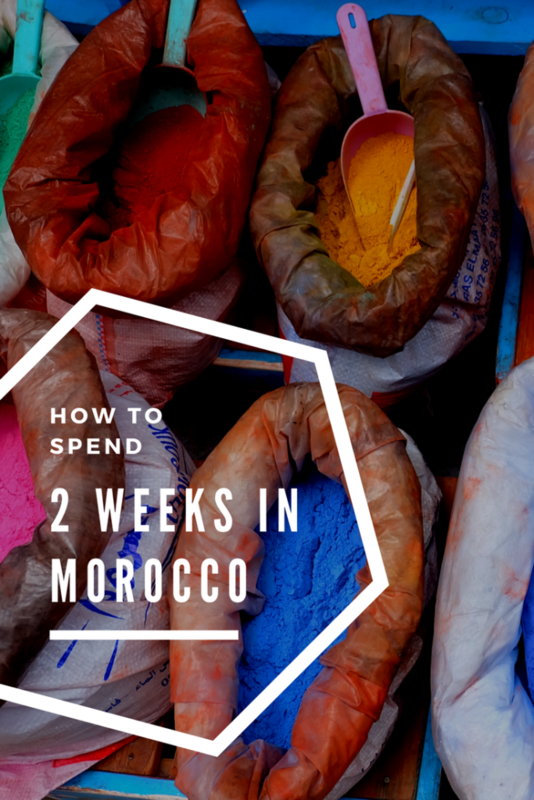 Here is my recommendations for what to do with two weeks in Morocco. Enjoy! Psssst… I also have a one week itinerary you can check out here. You’ll either fly into Casablanca or Marrakech, so this itinerary can be taken one way or another. Casablanca unfortunately doesn’t have too much to offer, so with limited time, I’d recommend getting to your next destination sooner than later. However, if you have some time to kill in Casablanca, mostly all locals will tell you to visit the Hassan II Mosque, the second largest mosque in the world. You can also visit the old and new medinas, and explore the art deco area. 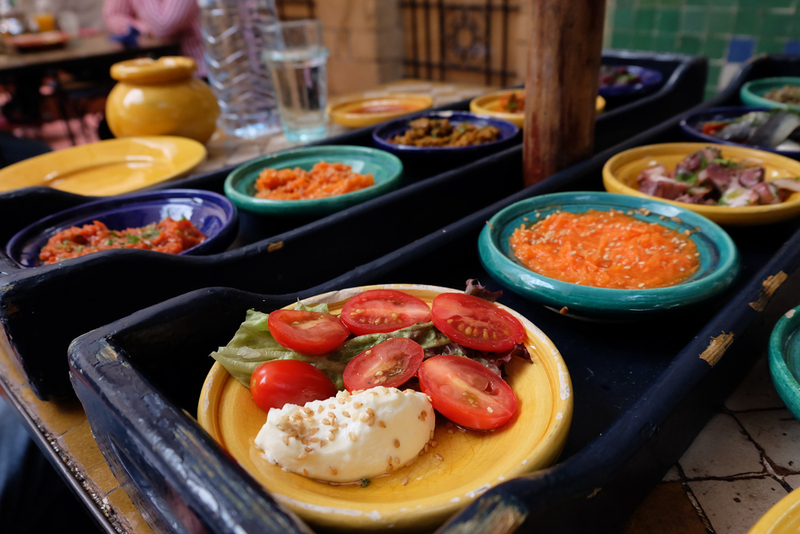 Popular spots for eating are Rick’s Cafe, a cafe that recreates the bar in the classic movie Casablanca, and Sqala (where I ate), which boasts a beautiful garden and great food. When I was in Casablanca, I actually hired a local guide to show me around which was a great intro to the city. The guide I hired I found on Tours By Locals and his name was Mohamed. He was fantastic and so kind, plus I could tailor the tour to what my interests were. You can book him here. 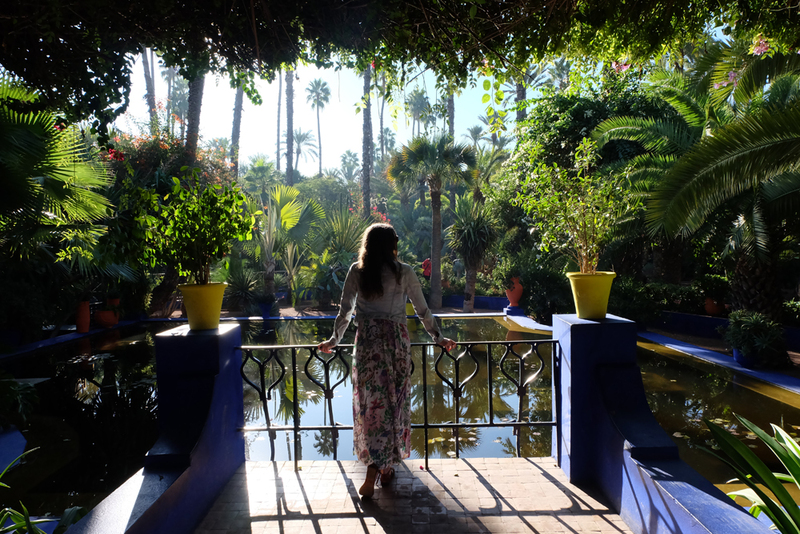 I stayed at the Moroccan House Hotel on my visit and it was beautiful! Click here to book it & learn more. One of the highlights from my entire trip to Morocco and a city that cannot be skipped! 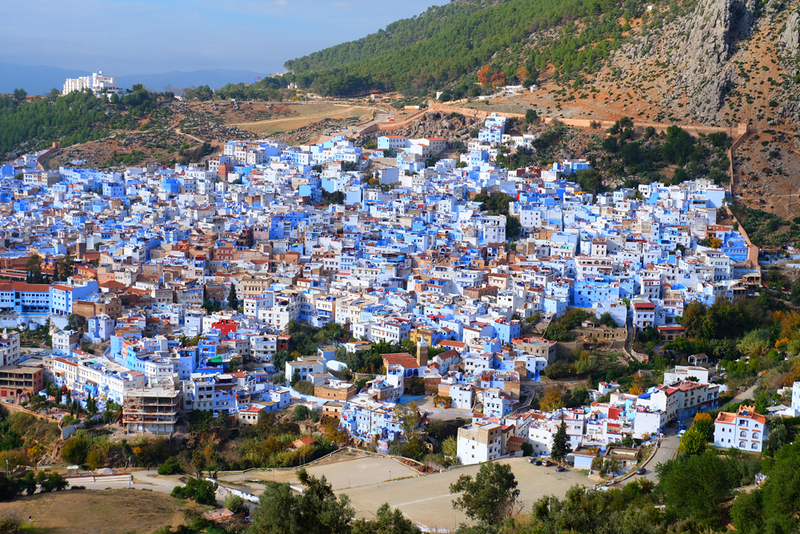 Chefchaouen is probably one of the most Instagramable places in the whole country (see my photo essay here) and that’s because of all the blue painted buildings and houses. There are several theories on why the city is painted in blue but no one really knows for sure. One popular theory is that it keeps the mosquitos away, another theory is that Jews started painting them blue in the 1930s when they took refuge from Hitler. Anyway, the city is absolutely stunning and you can seriously wander and get lost among the blue painted walls for hours or days. 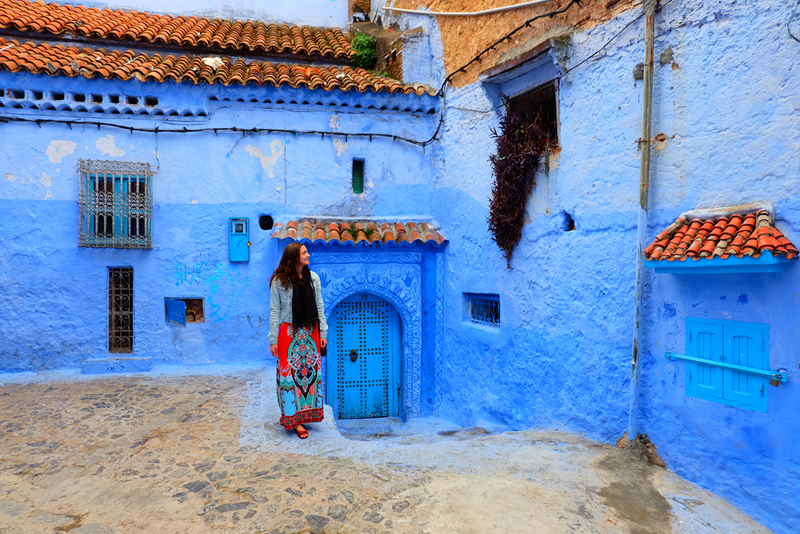 When you make your way to Chefchaouen, which can be done by train, bus or car (more details here), I suggest you first off spend most of your day wandering through the alleyways and shopping at the little shops and boutique that line the streets. Also, take the 15-25 minute hike to the Spanish Mosque to get a panoramic view of the city. If you’re looking for places to eat, I tried Bab Ssour and it was really tasty with a great view! I stayed at the cutest hotel in Chefchaouen called Hotel Madrid. It was centrally located with the friendliest staff. Next head off to Fes, referred to as the country’s cultural capital. Fes can be reached by bus or car in about 3.5-4 hours. If you’re driving, it may be of interest to you to stop at Volubilis to see the UNESCO roman ruins and/or Meknes, but neither were huge highlights for me. However, it really depends on your interests. 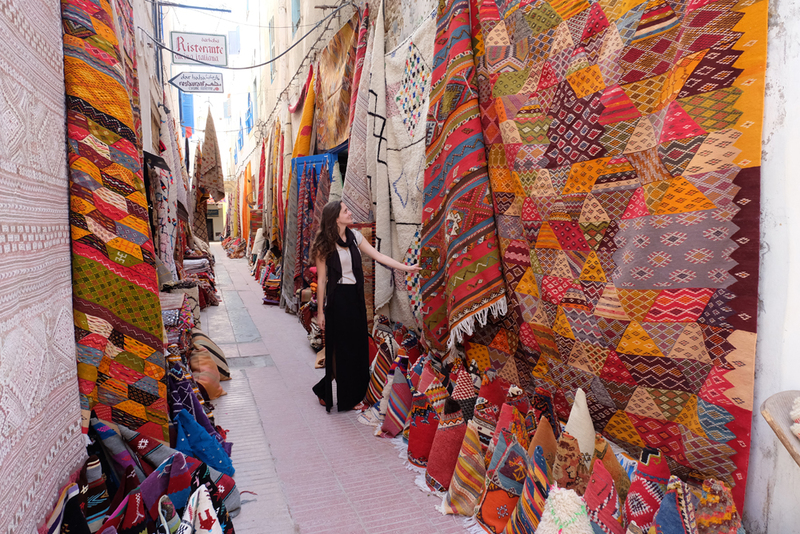 Once you arrive in Fes, there are a ton of things you can do but the most important thing to do is get lost in the old medina. This medina was founded in the 9th century and is home to the oldest university in the world. The medina has over 9,000 alleyways to get lost in and that’s why it’s suggested that you hire a local guide to show you around so you can ensure you see all the best parts, and that you make it out when you’re ready to go home! 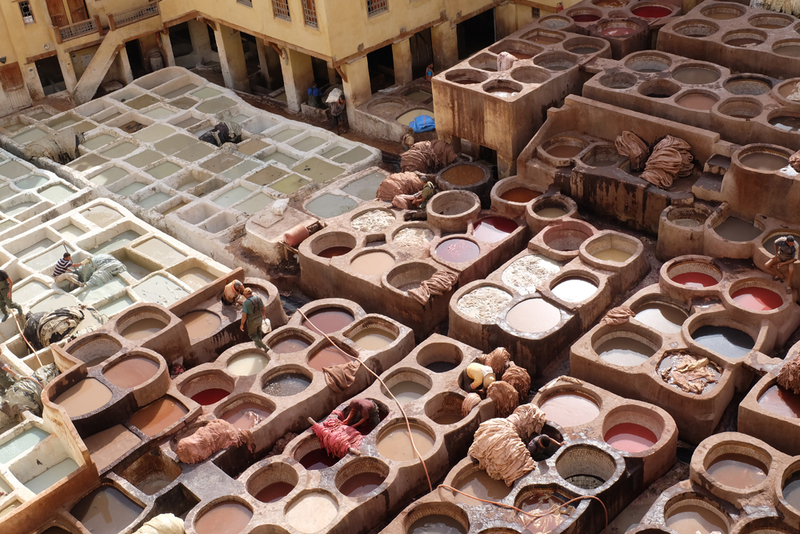 Another must-do in Fes is visit the leather tannery. This is one of the city’s most iconic sites and it shouldn’t be skipped. Seeing them opens the window to the unique process on how leather is made using methods that have been used since the medieval times. The only way to see the tannery is to go to one of the many leather shops that surround the site, as mostly all shops have a terrace that gives you a panoramic view. Beware! Leather goods in these shops will be priced high. 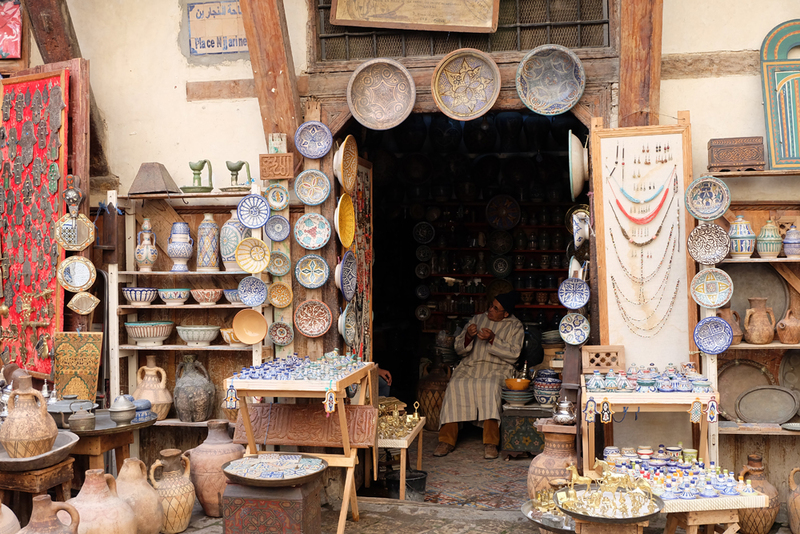 There are also a ton of other things to do in Fes. You can see the famous ceramics and mosaics being made at Art Naji, visit Medersa Bou Inania, see the Royal Palace, and the list goes on. If you ever made it out of the Fes medina, it’s time to hit the desert. Head towards Merzouga to feel the sand of the Sahara between your toes. 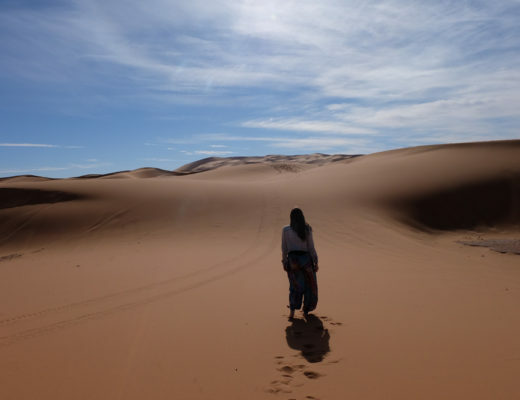 Merzouga is a small town located in the desert and is an easy place to either stay at a local auberge or take off on a camel trek to one of the many desert camps. I stayed at the Auberge Yasminafor a night before taking off to my desert camp which they can help arrange. If you aren’t driving, it may be easiest to book your desert visit through a tour company in Fes because it’s not the easiest to get yourself there. Get lost in the sand dunes and explore this beautiful and unique landscape. It honestly will be a highlight of your trip! 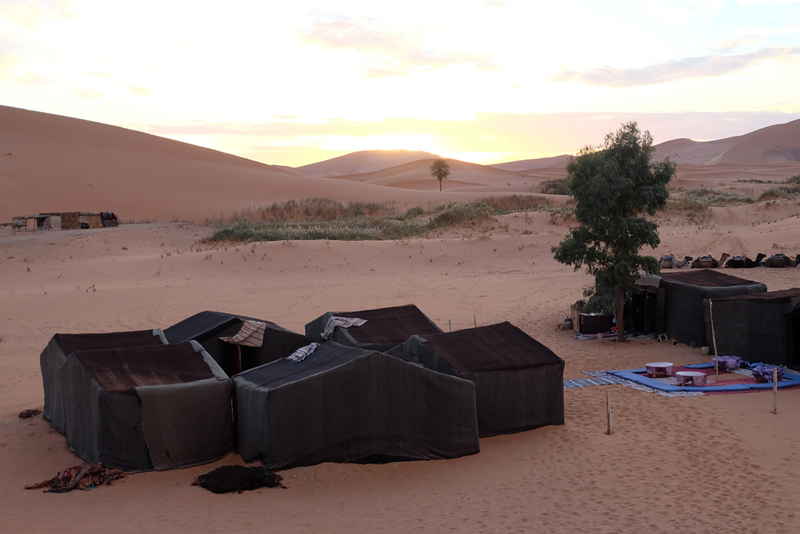 One thing to note though is that the temperature can dip quite cold in the winters in Morocco so make sure to pack a ton of layers for your overnight stay at the camp! Read my full article on my time in the Sahara here. Once you leave the desert, head towards Todgha Gorge and Ait Benhaddou. To get from Merzouga to Todgha Gorge, if you’re not driving yourself or have a local driver, you’ll have a bit more of a journey to take. The Gorge is only about 3-3.5 hour drive, however, there are other options to get there that you can read more about here. 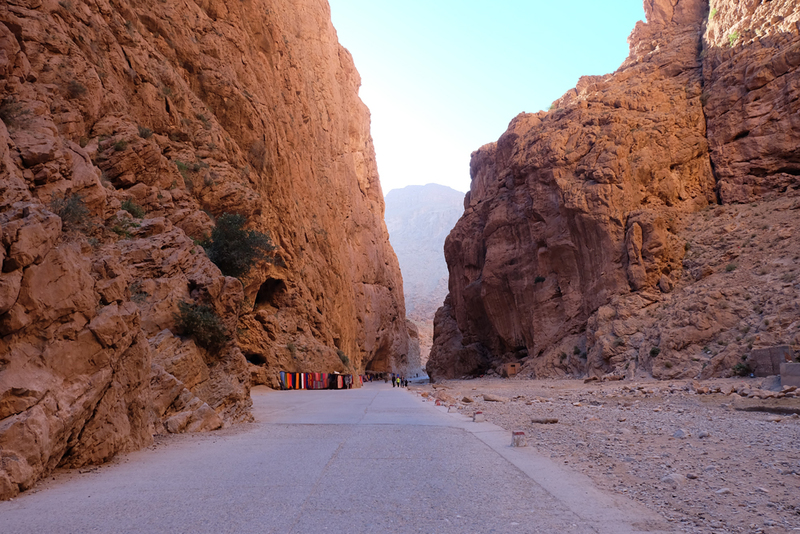 Todgha Gorge is absolutely stunning, however, you don’t need a ton of time to see it. Essentially it is a series of limestone river canyons in the eastern High Atlas Mountains. 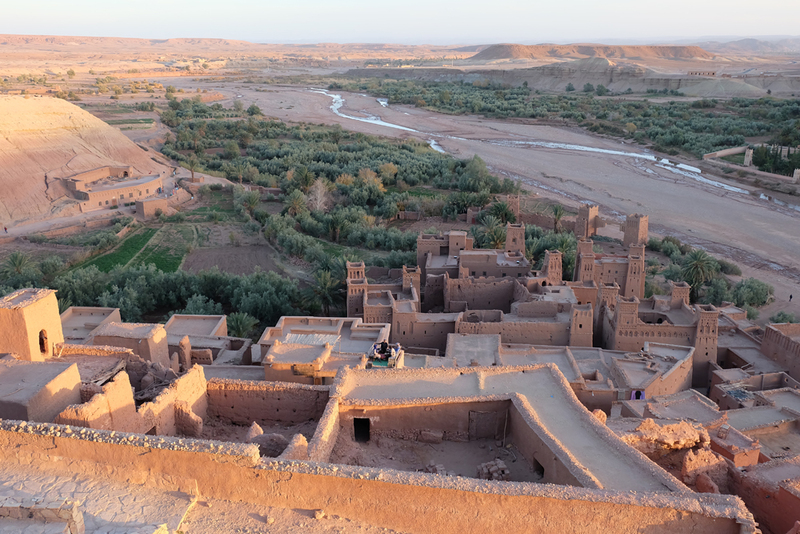 After visiting the Gorge, head to Ait Benhaddou for a visit and the night. This drive will take around three hours but you can reach Ait Benhaddou by bus which takes just under four hours. This city is a traditional mud brick city on the edge of the High Atlas Mountains and is a UNESCO World Heritage Site. It also has been featured in multiple movies, most famously Lawrence of Arabia and Gladiator. Climb a top the hill to see the breathtaking views and just take some time getting lost and exploring. Wake up in Ait Benhaddou and head onward to Aroumd for an afternoon and night in a traditional homestay in the High Atlas Mountains. DRESS WARMLY because even though I slept indoors this was the coldest sleep I’ve probably ever had (next to my sleep in the Sahara). Note that I visited in November/December so this can differ depending on season. This village is tiny with a population of less than 2,000 people. It sits 1,900 meters above sea level and you’ll need to walk (or take a donkey) about 40 minutes up the valley from Imlil to reach it. It’s quiet, peaceful, and staying in a traditional home is truly a unique experience that you wouldn’t necessarily expect to have in Morocco. 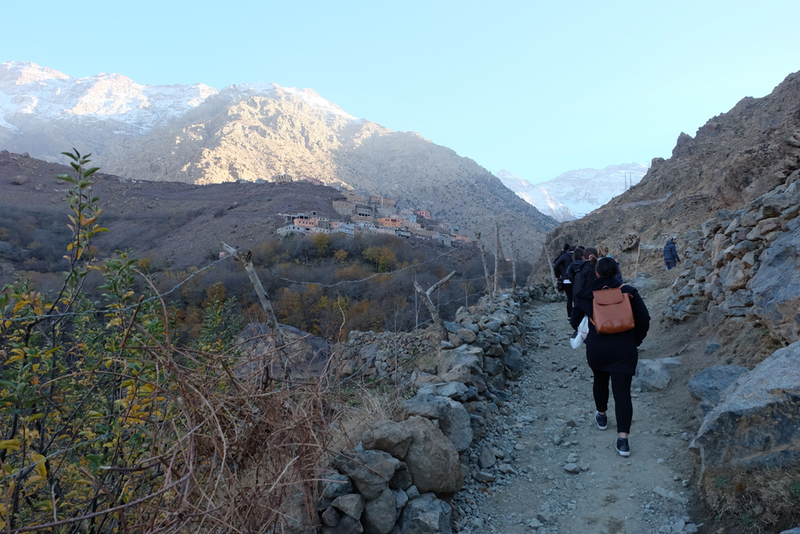 There is also a ton of hiking you can do in the area including Mount Toubkal, the highest peak in North Africa (warning: not for any Average Joe to conquer). One of my favourite spots during my two weeks in Morocco, Essaouira is a magical, hippie beach town located on Morocco’s Atlantic coast. This town gave me a different, less uptight vibe then any of the other towns and cities we visited on our trip. People seemed to move at a slower pace and I really enjoyed it! On route to Essaouira, make a stop at one of the many argan oil co-ops you’ll see along the highway. If you’re lucky, you may even see some goats up in the argan trees eating the fruit! Which is known to be part of the process for making the magical golden oil we’ve grown to love even back in North America. 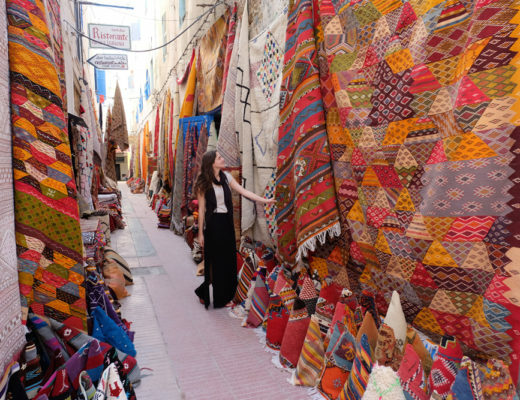 Essaouira is a wonderful place to slow things down a bit, get lost in the medina which is way less intimidating than the ones you would’ve seen in other places on this itinerary like Fes, enjoy some sun on the beach, and try some local seafood. One thing I’d highly recommend you do is head down to the harbour which is lined with fish vendors serving their catch of the day. 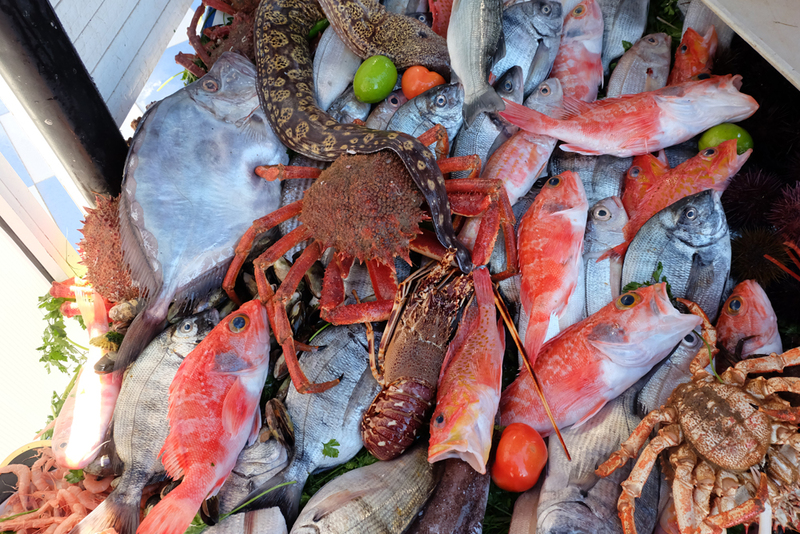 Pick your fish, they’ll weigh it, and fry it up right there for you. Make sure to pay attention to the cost first because this was probably the most expensive meal I had on my trip because I wasn’t paying attention to the weight. 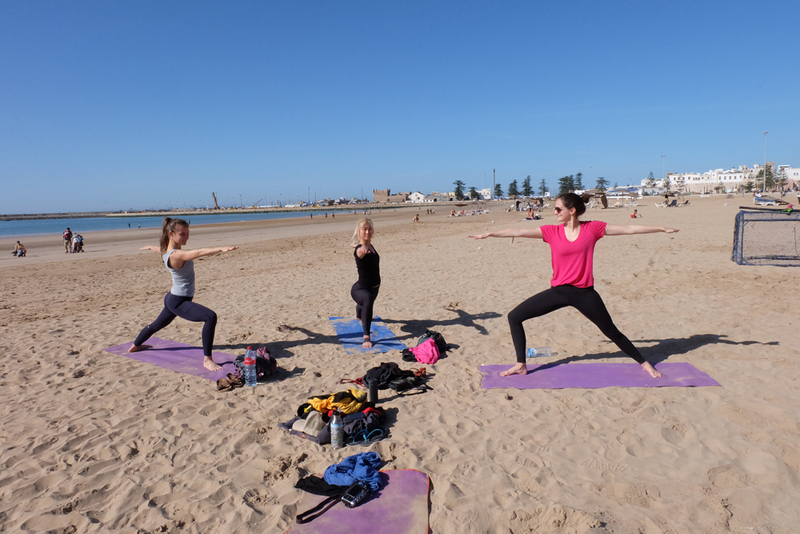 If you’re into yoga, we managed to find a great instructor who taught private beach yoga classes. You can find him here. 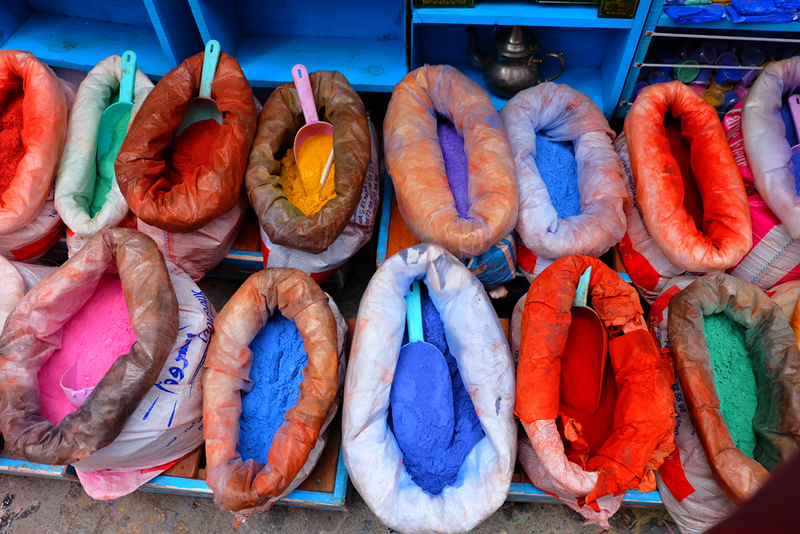 Here is a great guide on how to spend a few days in Essaouira. Your final stop on your grand tour of Morocco should obviously be Marrakech because you can’t miss it. Some say you need more than a day here but I found it was quite easy to get a ton done in a day! 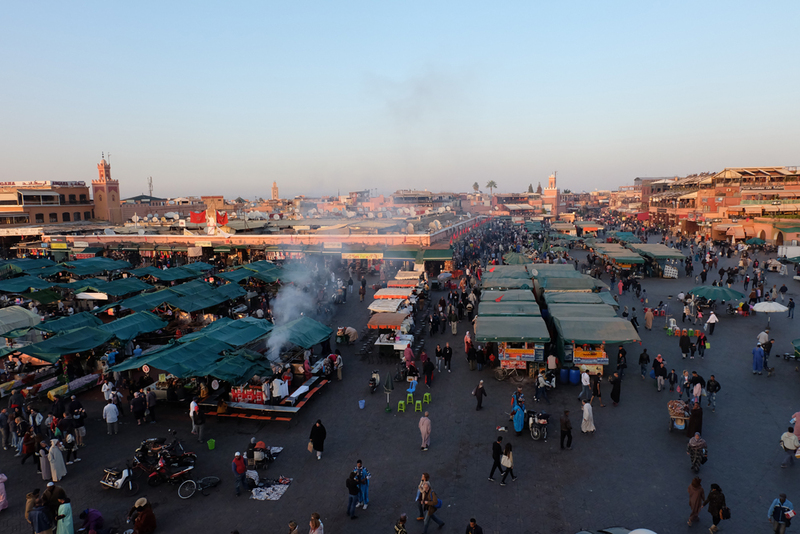 Last but not least, you HAVE to visit Jemaa el-Fnaa, the large public square that truly defines Marrakech. Stroll through the chaos of the square that just gets busier and louder as the night goes on. Watch out for the snake charmers because if you make eye contact with them, you may end up with an unwanted snake around your neck! Drink freshly squeezed juice, shop amongst the alleyways of the medina, this square alone is worth a visit to Marrakech. In conclusion, I can promise you’re going to fall head over heels for this beautiful country and make sure to bring a camera with you because I think this is one of the most photographic places I’ve ever visited! Note: I took a G Adventures tour in Morocco which made getting around a lot easier. If you’re interested in a guided tour versus going at it alone, click here for the latest G Adventures tour deals. Pin the below image to save this sample itinerary for later!